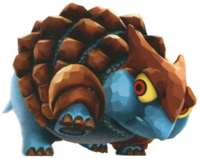 Rollodillo is an armadillo-like boss in Super Mario Galaxy 2. It is fought in the Boulder Bowl Galaxy in the mission Rock and Rollodillo. Rollodillo is a large beast with a reptilian-like face and mammalian body which is covered in thick blue fur. It has a hide made of pieces of rock which covers most of its body. It attacks mainly by rolling around the planetoid like a boulder. Mario can only fight Rollodillo as Rock Mario. There are a total of two rounds. When Rollodillo gets dizzy and stops rolling, Mario needs to transform into a boulder and ram into its weak spot, its rear. A Spin Attack is rendered useless against this boss. Mario will need to hit Rollodillo's rear four times to defeat him. After this, the boss explodes and grants Mario the Power Star. French (NOE) Tatouboul Portmanteau of 'armadillo' and 'ball'. Rollodillo shares its boss theme with Sorbetti, Prince Pikante, and Peewee Piranha. This page was last edited on October 11, 2018, at 02:00.